What do Sandy Webb, Glen Boren, Steve Bennett, Raymond Graham, Johnny Grimes, and Derrald Beck have in common? They are the seldom-seen volunteers, who do the majority of their hard work on days when the food bank is closed. They drive the truck to pickup food orders at various grocery stores, pickup very large donations from corporate food drives or from stores such as Walmart who donate most every week nearly a ton of food surplus they unload the trucks, and they sort food drives looking for expired items and homemade canned food1. The most important task this group of unsung heroes does is to restock the shelves. This task involves much more than merely putting cans and boxes on the shelves. They rotate the stock so that the first items in are also the first items out. This prevents us from inadvertently putting an expired item in the boxes . 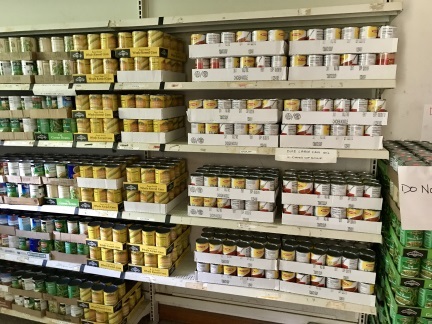 A second very important task involves maintaining an inventory of the individual items as they stock the shelves in order to ensure as much as possible that, when we are open, there will be enough of each item. Third, they ensure that the tables in the client area and in the workroom have sufficient filled boxes to meet the initial demand when we open for to assist our neighbors. Many thanks to our stock crew for all your hard work. PLEASE DO NOT RESTOCK THE SHELVES WHEN YOU ARE ON DUTY. 1Good Food-Handling Practices will not allow us to stock canned-at-home items.